Champaign, IL—Expensive weight machines may provide strength gains and increased muscle mass, but according to strength and conditioning expert Dr. Phil Page, strength bands are just as effective. “Research demonstrates that elastic resistance training provides as much benefit in strength gains as the use of more expensive and cumbersome weight-training equipment,” says Page, who has worked with the NFL’s New Orleans Saints and Seattle Seahawks. “Elastic resistance training also frees you from the limitations of gravity, allowing you to isolate muscles and perform the same movements in a totally different way. In his second edition of Strength Band Training (Human Kinetics, November 2010), Page and coauthor Todd Ellenbecker offer the latest research and advances in band training while presenting more than 160 exercises targeting every major muscle group. According to Page, just one band can be used to strengthen all the major muscle groups with exercises, such as a bench press, seated row, leg press, or hamstring curl. Elastic bands may also be used to strengthen specific muscles that can’t be activated with muscle-specific machines. Strength bands also offer stabilization training by targeting the core muscles through whole-body exercises. “Elastic resistance allows you to exercise multiple joints and planes in a standing position (rather than seated on machines), thus bringing more core training into the same machine-based exercise,” Page says. He adds that it’s much harder to cheat with an elastic resistance exercise because momentum can’t be used to jerk a weight into position. Unlike weight machines, strength bands are portable and inexpensive and offer a versatile workout. “By simply varying the level of resistance, the number of repetitions, and the speed of the exercise, you can tailor a program for weight loss, body toning, and general strength and conditioning, or you can improve speed, power, and agility for sports,” Page says. 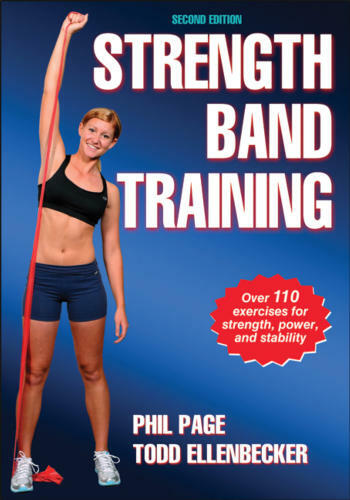 The Strength Band Training book was mentioned in an article on Livestrong.com about strength training with bands. Livestrong.com is partnered with the Lance Armstrong Foundation and provides fitness and wellness information. The website also provides a nice overview and history of Thera-Band resistance bands. For more information on muscle imbalance, visit www.jandaapproach.com. The second edition of Strength Band Training is now available! Learn how to use elastic bands and tubing for resistance training, stretching, and sport-specific training. Resistance bands are great for strength and conditioning as well as health and fitness training. Strength Band Training provides the scientific basis for elastic band exercises, basic strength training for all body parts, and specific exercises for sport training. This new book is just in time for the holidays and makes a great gift, particularly for anyone starting a fitness program in the new year. Updated with more exercises and all new photographs featuring start and stop images, the 2nd edition also incorporates new sport training routines. Be sure and get your copy now! For a limited time, you can get the Strength Band Book and a FREE Thera-Band resistance band in this special introductory offer!